It seems that with every major, a storyline emerges that defines not only the fortnight, but the immediate landscape of the game. The women's game of late, has been dominated by an absence of dominance. Where Rafael Nadal, Novak Djokovic, Roger Federer and Andy Murray provide a level of stability and star power to the men's game, the women have been searching for a champion in more ways than one. The last year on the WTA tour, entitled Waiting For Serena ended this Wimbledon in more ways than one. Of course, Serena Williams returned to the tour in Eastbourne and put up a valiant defense of her Wimbledon crown, especially considering she'd only played two matches since she hoisted the Venus Rosewater Dish. On the other hand, though, the youngest semifinalists in recent memory are playing for this year's title. The current favorite may be the sole household name Maria Sharapova, but there's no writing off even the lowest ranked member of the quartet, Sabine Lisicki. The 21-year old German was ranked as high as No. 22 in 2009, but finished last year ranked No. 179 in the world. As recently as this year's French Open, a mere month ago, Lisicki collapsed in a heap after narrowly missing out on the chance to upset World No. 3 Vera Zvonareva in the second round. A well-timed surge, winning the Eastbourne just two weeks ago, is the only thing that secured her entry, as a wild-card, into the tournament. Well done, All England Club. Why are we lauding the return of Lisicki? The big-serving German played winning ball before injuries stymied her progress; has been struggling to get herself back into the upper echelon of the game and ultimately, got her groove back on the grass. Lisicki is on an 11-match winning streak and will be back in the WTA Top 30 when Wimbledon ends. This isn't a fluke, this is a dream deferred. Lisicki is back where she ought to be. With Serena Williams out of action, her sister Venus on-and-off, Justine Henin presumably returning to the world of Belgian reality shows and Kim Clijsters working part-time, it seemed as if the fates should've smiled on Maria Sharapova. In fact, when Henin retired the first time, in 2008, it was Sharapova, then the reigning Australian Open champion who would succeed her rival at World No. 1. We all know how that would end. Sharapova would struggle with her shoulder, miss the back half of 2008, the front half of 2009 and fall from No. 1 to No. 126 in the world. During Sharapova's injury-driven exile Ana Ivanovic, Jelena Jankovic and Dinara Safina all squatted for a time in the WTA penthouse. Even last year, as Sharapova played a full schedule for the first time since 2007, she struggled with her serve to a point where pundits, including yours truly, began to write her off as a contender for the biggest titles. The water under the bridge made Sharapova's dominant 6-1, 6-1 win today over Dominika Cibulkova even more poignant. Yes, Maria won Rome and made the semifinals on clay at Roland Garros, but this is where she can make us truly believe again. Sharapova famously won this title as a 17 year old in 2004 overf Serena Williams. This weekend, she'll have the chance to reach and win the final as the elder stateswoman of the crew, at the ripe old age of 24. Not only are young players like her fellow semifinalists, Lisicki, Victoria Azarenka and Petra Kvitova rising to fill the void left by the stars of the last generation, but the player who should've owned this transitional era is back in the mix too. She (and her wayward serve) may have come back just in time to pad her Hall-of-Fame resume. 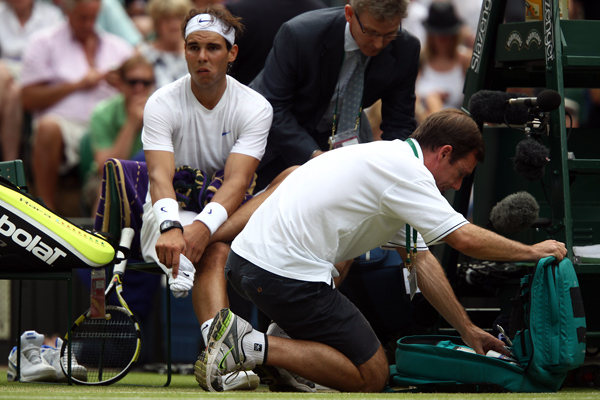 Never fear, the most fretted about foot in tennis seems to be OK. Rafael Nadal's press team says that a bad tape job was the culprit for his woes yesterday. Take it for what you will, the statement indicates the Spaniard is ready to play Mardy Fish for a spot in the semifinals later today. Mark my words, Fish will test Nadal and his injury or lack threrof. It's the only way forward for the American. Perhaps you have opted to purchase the custom hublot replica sale, however tend to be uncertain associated with how you can start purchasing one? Becoming cautious whenever purchasing a custom view is essential, afterall it might took a person several weeks otherwise many years in order to save upward for just one, which means you would like to make certain that you receive a great rolex replica sale. Furthermore, if you are after having a top quality manufacturer after that you have to be conscious that the should you purchase from a good unmonitored industry then you can obtain conned and buying the bogus 1. Within the town center Ohio mens custom wrist watches can be purchased from numerous rolex replica sale jewellery shops which assure authenticity as well as high quality. Select your own shop very carefully, extra supplies for example long stretches associated with ensures as well as great insurance coverage provides tend to be nutrients in order to consider. With regard to additional elements which may help you choose the actual custom view you would like rolex replica upon. Discover the marketplace worth. Whenever you lastly select a custom view you want to purchase you have to discover it's marketplace worth. Whenever you purchase a clothing or even coat you select this based on which kind of design a person rolex replica, you do not simply purchase 1 randomly.